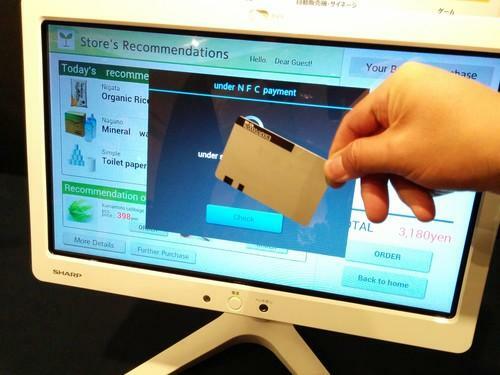 Sharp on Tuesday showed off a prototype screen embedded with a transparent NFC antenna that processes payment when touched with an NFC-equipped card. It could be used as a point of purchase in cash register or vending machine screens. LCDs aren't ideal for drawing, but you might be hard-pressed to remember that with Sharp's latest displays. The capacitive touch panel screens, shown off Tuesday in Tokyo, provide an experience that's closer than ever to working with pen and paper, even with large screens. Technology in the prototypes could be used in a range of applications from sketching to calligraphy to writing memos on mobile devices. At a demonstration at its Tokyo headquarters, staffers used a long calligraphy brush with capacitive fibers to write on a 70-inch LCD screen. They wrote a series of Chinese characters with a finesse that resembled traditional brush-and-ink writing, an ancient art form in East Asia. On another screen, they used a smaller brush to add touches to an illustration of a dragon that resembled a watercolor painting. The screens also respond to pencils and other capacitive tools. Capacitive stylus brushes and touchscreens that respond to pencil have been commercialized already, but Sharp says its displays are more sensitive and work with large formats. When screens are larger, noise from the display reduces the sensitivity of the touch panel. Sharp was able to keep the noise in check by using a parallel drive sensing method, which drives the processes of multiple touch sensors at the same time. By adjusting the signal-processing software for the screen, Sharp achieved a signal-to-noise ratio about eight times higher than that seen in conventional sequential drive controllers, according to the company. While the screens are still under development, large, highly sensitive touch panels could be used for creative, educational and business purposes such as digital whiteboards. Smaller versions could form the basis for more sensitive mobile device screens. Sharp also showed off a number of other displays. It updated its Free Form Display, announced last year as a prototype in-vehicle screen with curved sides, by adding an arched top that has a touch sensor along the edge. By moving his fingers along the edge and tapping it at various spots, a staffer called up different perspectives in a 3D car navigation app, as well as various music selections and views from exterior car cameras. Sharp also exhibited a cash-register screen with a transparent embedded NFC antenna that allows customers to simply touch an NFC payment card to the screen to make a transaction, eliminating the need for a separate payment terminal. The technology could also be used in next-generation vending machines, letting users buy a drink by touching an NFC card to an image of it shown on the machine's display. The company plans to mass produce the Free Form and NFC screens in 2016, but has not decided on plans for large capacitive touch panels yet, a spokeswoman said.